22.7.2008 – Reupload. Version is now 1.2. 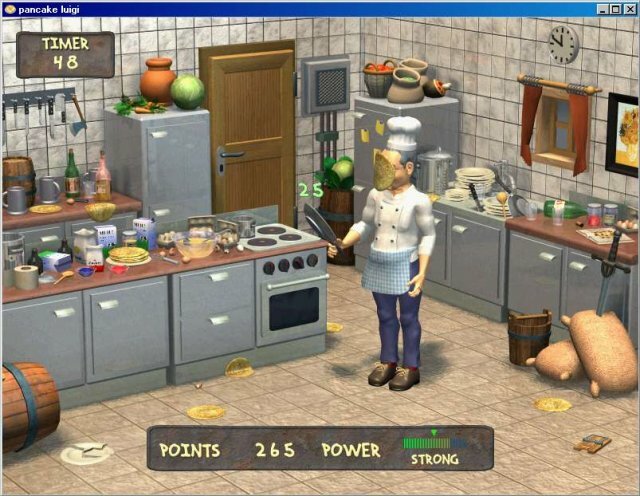 19.11.2006 – Pancake Luigi is a very small and easy Fungame for the case that you have one or two minutes left. Throwing pancakes. You play by simply clicking with left Mousebutton. Or by pressing Spacebar. Then Luigi throws his pancake. Gamegoal: as much perfect pancake throws as possible within the given time. You can get some more extra time by throwing perfect three times after each other.